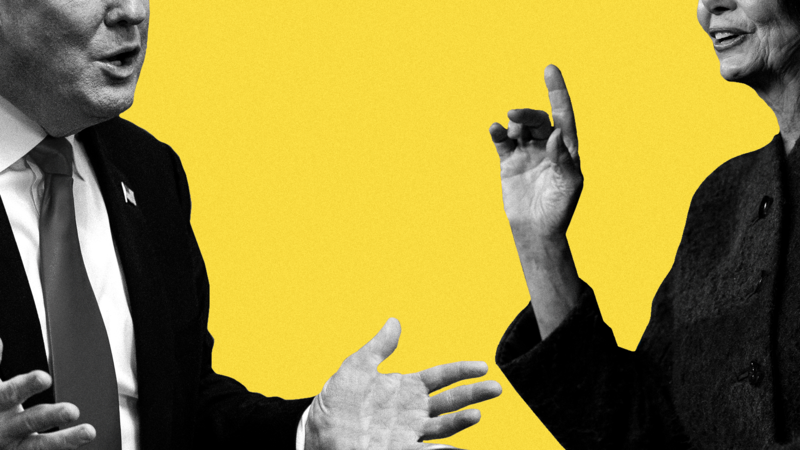 Just yesterday, Pelosi rescinded Trump's invite to speak on the House floor for the State of the Union. In today's surprise, the president revealed Pelosi was leaving on an overseas trip with Democratic lawmakers by releasing a letter telling her she couldn't use military planes for the trip. "Due to the shutdown, I am sorry to inform you that your trip to Brussels, Egypt and Afghanistan has been postponed. We will reschedule this seven-day excursion when the Shutdown is over." "Obviously, if you would like to make your journey by flying commercial, that would certainly be your prerogative." Between the lines: Aides had asked news organizations not to publicly report the details of Pelosi's trip due to national security concerns, CBS' Steven Portnoy notes. She was scheduled to depart at 3 p.m., just 30 minutes after the letter was released, Fox News' John Roberts reports. 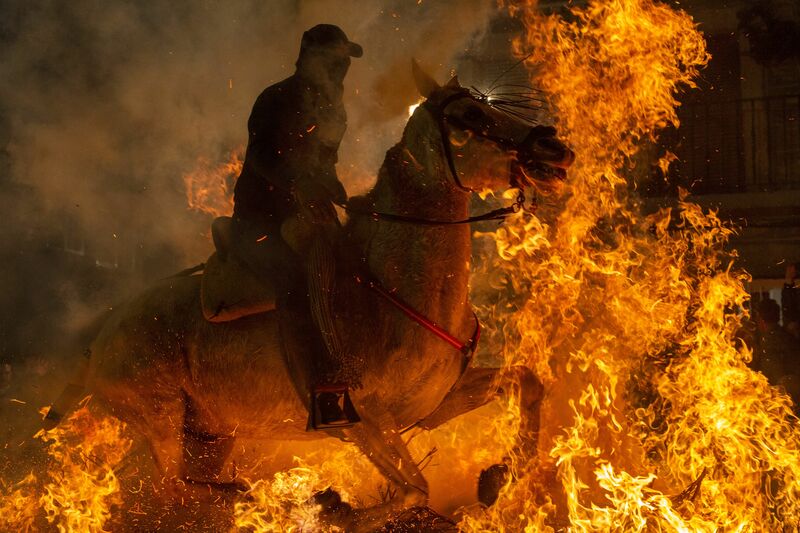 A man rides a horse through a bonfire during "Las Luminarias" Festival in Spain. In honor of Saint Anthony the Abbot, the patron saint of animals, horses are ridden through the bonfires on the night before the official day of honoring animals in Spain. The tradition, which is hundreds of years old, is meant to purify and protect the animal in the coming year. Thousands of migrant children may have been separated from their parents at the U.S.-Mexico border before the Trump administration's zero-tolerance policy was officially announced. Go deeper. Former CBS chairman and CEO Les Moonves has told CBS' board that he intends to dispute its ruling to strip him of his $120 million severance after he was fired with cause. Go deeper. Facebook has removed hundreds of pages and accounts that pretended to be real news sites from places in Eastern Europe, but were actually operated employees from Russian state-owned news company Sputnik. Go deeper. The House approved a resolution to oppose the Treasury Department’s decision to ease sanctions on companies tied to Russian oligarch Oleg Deripaska. A research team drilling thousands of feet under the Antarctic Ice Sheet has found new evidence of microbial life there — life forms not known to exist elsewhere. Go deeper. 6. A judge acquitted three Chicago police officers on charges of trying to cover up the 2014 shooting of 17-year-old black teenager Laquan McDonald, which sparked nationwide protests. Go deeper. The AP got a behind-the-scenes look at Disney World's prep work for shows and entertainment. "The results of those labors take stage Friday when Disney World unveils a new Magic Kingdom parade, a Hollywood Studios street showing off the characters from 'The Incredibles' franchise, a Caribbean-style street band in Animal Kingdom and the start of an arts festival at Epcot." "In a few months, the resort opens a new animatronics show based on the 'Cars' character Lightning McQueen." Why it matters: "If the famous Disney Imagineers provide the 'wow' factor with their fantastical feats of engineering on rides and attractions, it’s the entertainment division that provides Disney World’s heart."